So, let’s say you’ve already created a wholey unique pirate wardrobe? What’s next? How’s about a truly unique, custom made leather tankard? Personally, I know I could spend forever and a day searching for that perfect mug that just screams “Bilgemunky” – all to no avail. But as you can see from the photo, I gots me one! This is thanks entirely to ScurvvyDawgs.com. They make a variety of leather goods, but it’s the tankard that I’ve had the pleasure to experience first-hand. All I had to do was provide a picture of what I wanted, they embellished that with their own colors and stylizations, and there it was – a lovely tankard that is truly worthy of the Bilgemunky. It should be noted that this is a far cry from the “cafe press” of leather goods, where images are slapped onto otherwise bland and identical products. 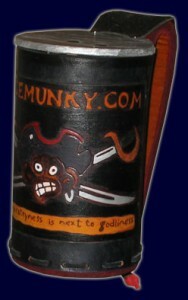 I’ve inspected many other ScurvvyDawgs tankards, and even without the various logos, each was unique – some had leather strands hanging from the handle with skulls, others had metal studs in the lid – there were many tiny little details that varied from tankard to tankard, making each truly original. This entry was posted in Other and tagged custom work, drinkware, scurvy dawgs by Bilgemunky. Bookmark the permalink.